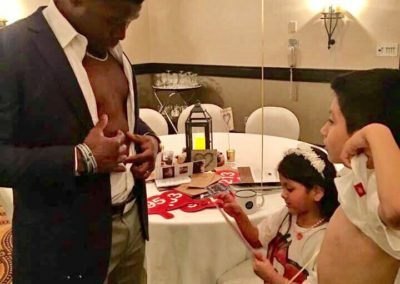 The TJ Carrie Foundation joined Camp Taylor’s team almost immediately after hearing about the free medically supervised camp for kids with heart disease. At Camp Taylor, “Kids Meets…Scars Blend…Wonders Happen” and TJ knew that this was going to be a special place that he could volunteer. Where else could he meet kids, show off his scar and make magic happen? TJ’s magical words about being optimist, to keep dreaming and to believe in yourself, make TJ the perfect role model for Camp Taylor. He reminds the campers of the Camp Taylor Motto: “Every scar has a story ~ share yous.” TJ volunteers at many Camp Taylor programs and fundraisers, in addition to making hospital visits to heart patients. Returning to Oakland Children’s Hospital where he had his heart surgery is always most meaningful. After meeting everyone at Camp Taylor, TJ knew that he wanted to personally give the children with heart disease something special that they could keep, thus the partnership with Shadow Buddies. Shadow Buddies are condition specific cuddly, plush Buddies that have been bringing smiles, hope and companionship to medically challenged children across the country and around the world since 1995. The TJ Carrie Heart Shadow Buddy is dressed in Raiders shorts and a “Carrie 38 Heart Warrior” t-shirt, complete with an embroidered heart and scar on the Buddy. Thanks to the TJ Carrie Foundation and Shadow Buddies, these children can now proclaim that they have a friend “just like me”. TJ will personally deliver his Shadow Buddies to Camp Taylor children and to heart patients at local children’s hospitals.